The Very Hungry Caterpillar and Other Eric Carle Favourites will be performed from March 15 to 24 at Manitoba Theatre for Young People. Narrated by the distinctive voice of Gordon Pinsent, the version is presented by Nova Scotia’s Mermaid Theatre. If you’ve ever read an Eric Carle stories to your children or grandchildren, you will already know how delightful these tales are. 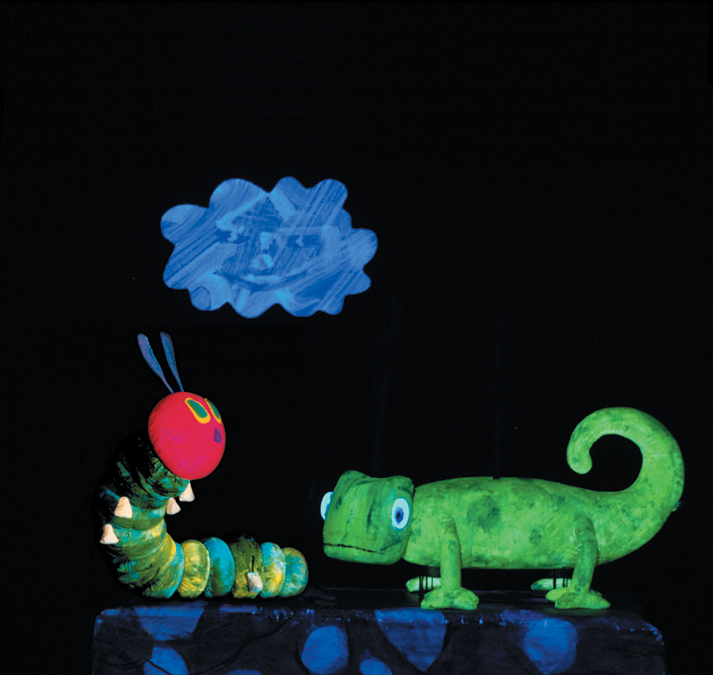 The hour long show features three of Eric Carle’s favourite stories and is performed with black light puppetry, where the puppets and scenery are covered in fluorescent paint so that they glow under the ultraviolet light. The show will bring to life Little Cloud and The Mixed-Up Chameleon in addition to Eric Carle’s most famous story about a caterpillar who nibbles through apples, strawberries, chocolate cake, a slice of Swiss cheese, salami, a pickle, a lollipop and a whole lot more. Mermaid Theatre is the same company who performed Goodnight Moon and The Runaway Bunny at MTYP last season. The company has been performing children’s theatre for nearly 50 years to more than four million young people around the world. Mermaid’s emphasis on imaginative design elements, original music, and challenging texts provides an opportunity to acquaint young spectators with the visual and performing arts as well as with the pleasures of reading. There are eight performances scheduled for Winnipeg, including a French performance on Saturday, March 23 at 4 pm. Tickets for The Very Hungry Caterpillar and Other Eric Carle Stories start at $20. Groups of 10 or more people get 20% off regular ticket prices. MTYP is located at 2 Forks Market Road. The company’s box office is open weekdays from 9 am to 5 pm. Call 204.942.8898 or buy online. I would like to receive offers as well as news.